I know that there is a perception in the general public about thetraditional government worker who has no incentive or desire to work hard. Ihaven’t found too many of those people working at NASA, and there certainlyaren’t any of them on the Orion Abort Flight Test Project. On an average dayNASA Dryden has 30 to 50 people, stationed at the White Sands Missile Rangein New Mexico, preparing for the big event: the first test launch of theOrion Abort Flight Test system. Center, and numerous contractors including prime contractor Lockheed Martin. the can-do attitude of our team and the need to keep everyone safe. preparation for the Pad Abort 1 launch. because I could fill 10 pages with kudos. in preparation for critical ground tests. ongoing on the day shift. And they did it ahead of schedule! leader, Paul Aristo, was promoted. monumental task under tight schedule constraints. We were told early in July about the trip to Casper. I began to look forward to such an adventure. Anything that involves flying and I am in. I then received the details of the mission and found out it was an education outreach. I enjoy sharing my experiences with the kids and the public. We assembled all the material for presentations we planned to make and were ready for the flight on July 13. The weather was great, which made the flight even more enjoyable. I had heard that the school we were going to was also tracking our progress on the Internet through one of the flight-tracking Web pages. Awesome! The mission was getting more exciting as the day progressed. We landed at Casper and were met by a very friendly staff at the fixed-base operation. We drove into town and enjoyed a quick lunch. Soon after, we were navigating through town and found the college where the class was being held. Our hosts helped us set up our displays and equipment, and we noted all the excitement in the room as the kids and staff eagerly awaited our presentation. The Power Point presentation on what NASA does and demonstrations in the class were incredibly well received. The question and answer session went on for close to an hour. All questions were interesting and well thought out by the class. Of particular interest was how water is consumed in space. The class was intrigued by this simple task. We then broke out into smaller groups to discuss space and aviation topics and gladly signed pictures for the kids. We had brought pins and miniature airplanes and the group was very appreciative. As the day drew to a close we were invited by the teaching staff to a dinner in town. We gladly accepted and were met at the restaurant by a great group of teachers. We shared stories and experiences as we enjoyed a great meal. The next morning we promptly got out to the airport to set up for the kids to visit the airplane. We were also told that a media crew might visit. After a short wait, the first school bus showed up with the first group of students. Some of the students had never been in an airplane. It was awesome seeing their reactions to coming inside and going into the cockpit. More questions came up and small discussions ensued on how the airplane works and how we navigate in the air. It was a great feeling inspiring these kids on something that I enjoy. I recall being their age and aspiring to be a pilot and wondering if I would ever get there. Telling my story to them perhaps energized some of them to follow my footsteps and career. Eventually the second bus showed up and more students got to see the airplane. The local TV station sent out a reporter and she also got to see the airplane and do an interview with us. It aired that night and was well received. When we had shown all the kids and teachers the airplane we prepared it for what would be an uneventful flight back to Dryden. What an awesome mission to inspire the kids in Casper, Wyoming! On May 14, I sat beside a blue lagoon beneath cloudless skies just three miles from Launch Complex 39A at the Kennedy Space Center in Florida, and felt a growing sense of “launch fever.” It had set in the day before as I stood at the edge of the launch pad – the same from which humans first journeyed to the moon – and watched the Rotating Service Structure roll back to reveal space shuttle Atlantis stacked on its external fuel tank and twin solid-propellant rocket boosters. As I stood there, it occurred to me that river gravel that comprised the roadbed beneath my feet had been crushed by the combined weight of the shuttle stack atop its Mobile Launch Platform and Crawler Transporter, weighing roughly 17 million pounds – the weight of history. NASA Dryden contract historian/archivist Peter Merlin stands in front of Launch Complex 39A following rollback of the Rotating Service Structure on the evening prior to launch of space shuttle Atlantis for STS-132. This rare opportunity arose from my work as a contract historian/archivist at NASA Dryden Flight Research Center where I maintain a collection of historical reference material and share Dryden’s accomplishments through various publications, exhibits, and presentations. I was visiting Florida because KSC was selected to host the annual NASA History Division meeting and training event in order to coincide with the launch of shuttle mission STS-132. It was a chance for historians from each of the NASA centers to witness history being made and share in one of the most visible accomplishments of the agency. With only three remaining missions planned before retirement of the shuttle fleet, STS-132 is the final scheduled flight of Atlantis. Mission commander Ken Ham, however, said his crew jokingly referred it as the “first last flight of Atlantis” because the orbiter will be prepared for a launch-on-need contingency rescue mission should something go wrong with the final scheduled mission, currently slated for November. NASA managers have also discussed the possible addition of another Atlantis mission, STS-135, to fly at end of the shuttle manifest in early- to mid-2011, but this has yet to be approved or funded. 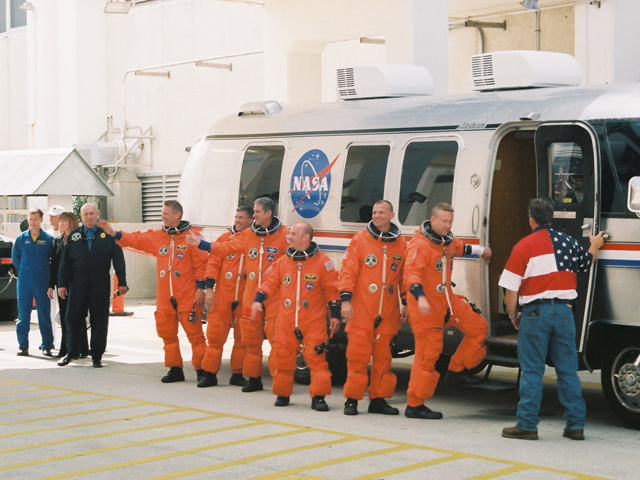 On the morning of the launch, I joined a small crowd of well-wishers to cheer and wave as Ham and his five crewmembers departed the Operations and Checkout Building in their bright orange space suits. “See you in two weeks,” shouted Ham just before boarding the Astrovan, a modified 1983 Airstream Excella motorhome. Later, by the water’s edge, I sat beside a 10-foot-high digital clock that ticked off the final minutes and seconds to liftoff. Looking around, I saw hundreds of news media representatives, students, and other invited guests, and I knew thousands more waited on the causeway between KSC and Cape Canaveral Air Force Station. It was a marked contrast to when I sat in this same spot nearly 25 years earlier to witness the maiden flight of Atlantis. 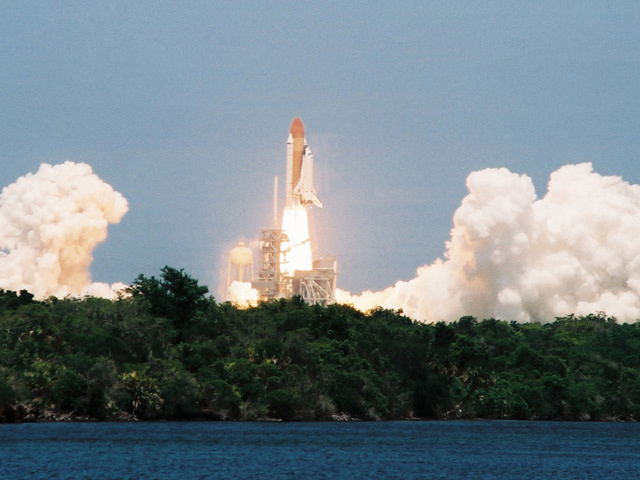 Since it had been a classified mission for the Department of Defense, guest passes were not issued to the public and even the exact time of liftoff was not announced in advance. For Atlantis’ swan song, however, NASA made an effort to accommodate as many visitors as possible, including about 150 “tweeters” sending out live electronic updates via Twitter. During the last few hours of the countdown I met with David Alexander, the Digital Learning Network coordinator for Oklahoma State University’s program at the Aerospace Education Research and Operations, or AERO, Institute in Palmdale, Calif., and a member of the Dryden Education Office. Together, we produced some prelaunch video commentary for possible application to Dryden’s web site or the DLN, an interactive learning program for students and educators that allows students to interact directly with NASA experts, engineers and researchers to gain new appreciation for the importance of science, technology, engineering and mathematics. Soon, the final seconds of the countdown were upon us. Two white plumes of steam issued from concrete flame trenches at the base of the launch pad as the shuttle’s three main engines fired, instantly evaporating most of the 300,000 gallons of water that had been dumped in just 10 seconds earlier. The spectacle was oddly silent, at first, because it took a while for the sound to reach the viewing area. A flash of orange signaled the ignition of the boosters, each producing 3.3 million pounds of thrust. Liftoff! A distant crackling sound quickly built to a pulsing roar as Atlantis thundered toward space on twin pillars of fire. The flames were unbelievably bright and seemed to display a rainbow of colors as the vehicle gracefully rotated, ascending toward orbit while arcing away toward the distant horizon. Within a few minutes the vehicle was out of sight and the winds soon dispersed the clouds of smoke and steam rising from the launch pad. At Dryden I have had the opportunity to witness more than 20 shuttle landings. They have a special grace and beauty but nothing can rival the awesome power of a launch and the opportunity to see humans journey into the frontier beyond our atmosphere that we have only begun to explore. 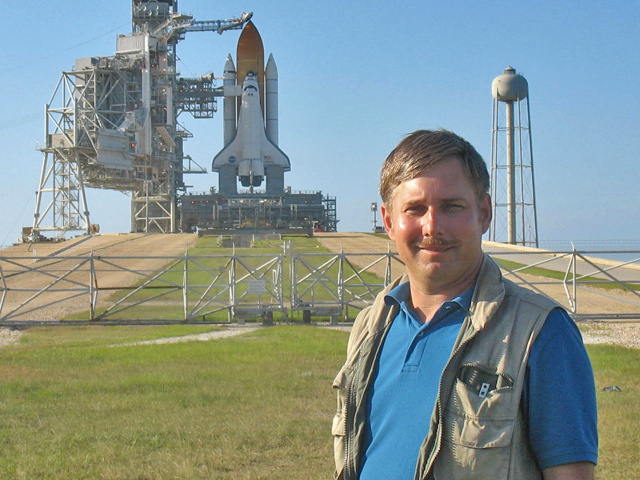 Peter Merlin of Tybrin Corp. is a historian at NASA’s Dryden Flight Research Center. Dryden Flight Research Center is NASA’s primary center for atmospheric flight research and operations. Dryden is critical in carrying out the agency’s missions of space exploration, space operations, scientific discovery, and aeronautical research and development (R&D).The Dryden Blog will be a collaborative effort featuring many center staff offering unique personal insights. Dryden is located on Edwards Air Force Base in the western Mojave Desert, a few hours outside of Los Angeles. We are uniquely situated to take advantage of the excellent year-round flying weather, remote area, and visibility to test some of the nation’s most exciting air vehicles. Dryden is the primary alternate landing site for the Space Shuttle and orbital support for the International Space Station. In support of scientific discovery, we manage the Stratospheric Observatory for Infrared Astronomy (SOFIA) program – a flying telescope aboard a Boeing 747 aircraft – in partnership with the Ames Research Center and the German Aerospace Center. In support of aeronautical R&D, we are involved in many aspects of the Fundamental Aeronautics and Aviation Safety programs, including the X-48 Blended Wing Body and Ikhana (Predator B) in support of subsonics and Adaptive Flight Controls in support of the Aviation Safety Program. For 60 years, Projects at Dryden have led to major advancements in the design and capabilities of many state-of-the-art civilian and military aircraft. The newest, the fastest, the highest – all have made their debut in the vast, clear desert skies over Dryden. Dryden Flight Research Center plays a vital role in advancing technology and science through flight. This blog will provide interesting perspectives on how we continue to push the envelope to revolutionize aviation and pioneer aerospace technology. Bookmark this site and check back soon to start learning more from our project representatives. For more details on Dryden, please visit our website https://www.nasa.gov/centers/dryden/home/index.html. Soil-moisture Research From the Air – Don&apos;t Rain on My Parade! The NASA Gulfstream III aircraft is currently in Saskatoon, Saskatchewan, Canada participating in an 18-day science campaign studying soil moisture. The campaign, known as Canadian Experiment for Soil Moisture in 2010, is a partnership between NASA and multiple Canadian government agencies and universities. The NASA G-III carries an active L-band synthetic aperture radar, or UAVSAR, that is capable of measuring soil moisture up to 50 mm beneath the surface while flying at approximately 40,000 feet altitude. Environment Canada, which is responsible for renewable resources, weather forecasting, and other functions, is our host while in Canada and they are flying a Twin Otter at about 10,000 feet altitude carrying a passive L-band radiometer. Multiple teams of scientists and graduate students are doing field sampling in the test regions. In addition to the ground-based and airborne assets, the work is being coordinated with overpasses from a number of internationally operated satellites. Airborne remote sensing obtains much better resolution data than the satellites, although over a much smaller region. For example, science flights are scheduled to coincide with the European Space Agency developed Soil Moisture and Ocean Salinity satellite. The CanEx test region, which covers an area of 33 km x 71 km on the ground, covers only two pixels of the SMOS image, while the G-III pixel resolution is 3 m x 3 m.
Hydrologists use accurate knowledge of soil moisture for modeling weather, predicting flooding and estimating crop yields. Accurate models can be very beneficial to nations and farmers in decision making, such as in deciding which crops to plant and when to irrigate or apply fertilizers. It can also be useful for fighting diseases such as malaria. The Soil Moisture Active Passive web site (http://smap.jpl.nasa.gov/) is an excellent site for learning more about the applications of soil-moisture research. 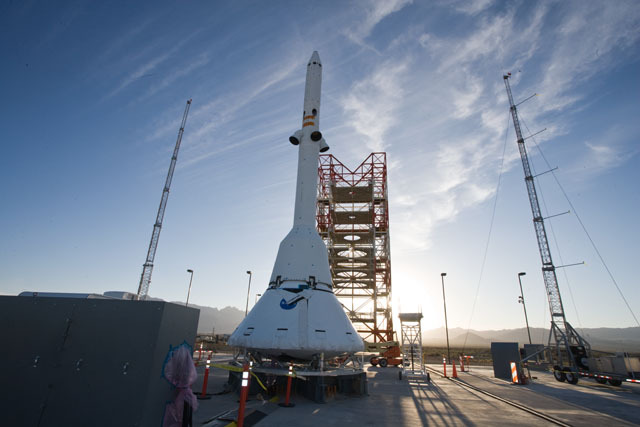 NASA plans to launch the SMAP satellite in 2014. NASA’s participation in the CanEx campaign is funded by the SMAP project because the combination of the two aircraft (active and passive sensing) will provide critical information for the purpose of developing algorithms for the SMAP mission. Saskatoon is known as the “city of bridges” in Saskatchewan which has the state motto “Land of the Living Skies”. It is actually quite pretty along the banks of the Saskatchewan River where our hotel is located. The region is very flat and primarily farmland. It turns out that years of drought are being broken during this science campaign – they have more soil moisture than they bargained for. The Land of Living Skies has lived up to its name also – not only has it been a problem for the science objectives, but it is a real problem for the local farmers, who have a shorter growing season than in the U.S. and have been unable to plant the majority of their crops due to multiple lakes and mud sitting on their fields. Uncharacteristically, the G-II has been grounded multiple times due to the weather. The G-III is an all-weather aircraft and the UAVSAR sensor that it carries can see through clouds and rain. Typically, weather does not stop us. However, this is a soil moisture science campaign and observations must be coordinated with concurrent ground-truth. It is extremely difficult to instantaneously characterize the ground condition, or to have people plodding through mud, when it is raining. The ideal soil moisture study would be a strong rain followed by remote sensing flights on multiple days without rain to observe the drying cycle. So far, we haven’t been so lucky. We have completed four science missions since our arrival here on June 1, squeezed in between days of rain. It is looking promising for a two- or three-day drying cycle starting this weekend and we are ready to support. We’re expecting to complete four more science flights before we head back to California on June 18, and are hoping that the weather will cooperate to enable us to obtain the data needed to support soil-moisture research and its broad-ranging applications for the benefit of all.